Here's a picture of me at Amy's house. She made me a yummy sundae, & her son thought I needed a candle. This was what she had!! 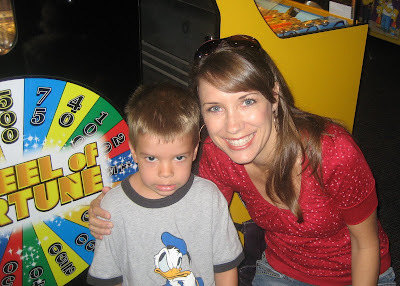 As I promised yesterday, here's a picture of Chase & me on our birthday! 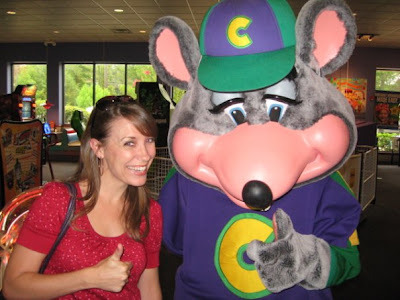 I also got to meet Chuck E. Cheese! I had a super great birthday week! Jess & I went out for dinner on Wednesday night & shared a couple of desserts. She got me a lovely iced tea pitcher! The kids & I had been stuck in the house all week (because Silvie was in the shop), so my friend Kim picked us up for lunch on Thursday. We went to Chick-fil-A, and she got me a chocolate shake as an early birthday present! Last night (after my fun morning at Chuck E. Cheese's & my afternoon at Amy's), we had our usual pizza & movie night at home. The kids watched a movie in the living room, and Chris & I watched Confessions of a Shopoholic! I got loads of sweet birthday greetings on facebook. It was a great day! I promise I'll post about our anniversary soon!